Once all sugar is incorporated, scrape down sides of bowl and continue beating until stiff peaks form. Divide frosting into several batches and put into freezer bags. We use freezer weight zip bags as pastry bags. They stay together quite well and there is less mess with little ones that like to squeeze the pastry bag in the middle causing frosting to come out both ends. To begin decorating your house, cut only one corner of the zip bag with a very small cross corner cut…about 1/4 inch. When you snip the corner of the bag to allow frosting to come out, remember: cut it small, very small. You can always make it larger but you cannot make the cut smaller. NOTE: To put houses together, I make a batch of royal frosting with 1/4 cup cocoa added to blend in with the color of the gingerbread pieces. I like to assemble the houses over a couple days to give the structure time to harden and better able to hold up to the weight of all the candies glued to the outside. You can do this days or weeks in advance. Just be certain to store the assembled houses at room temperature. One added bonus to having a gingerbread house in your home? It smells fantastic! Almost like a spice cookie potpourri. Using 2 sides and 2 end pieces, carefully lay a bead of frosting (much like using a caulk gun to lay a bead of caulk) along the ends of sides and stick to house ends. I like to assemble the sides first, let them dry fully then add the roofs. 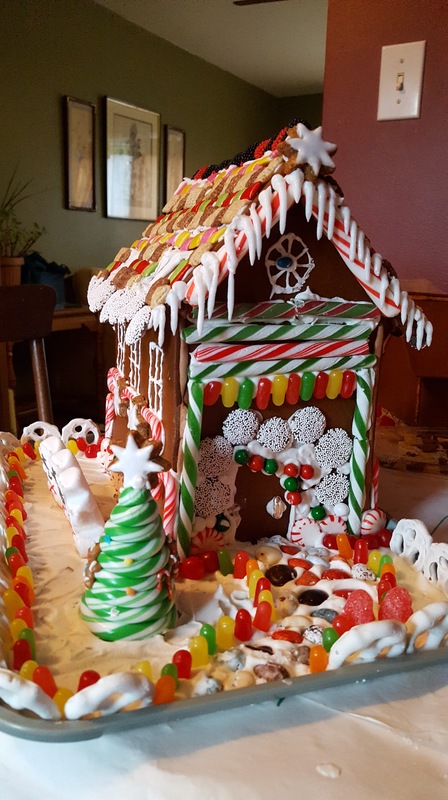 To add the roof; run a bead of frosting along the edges top of walls, place one roof piece and continue to run a bead of frosting along the edge of connecting roof piece. If pieces want to slide off, use a couple long (3″) pins like corsage pins to run parallel to ground, through both roof pieces (see photo). Leave these pins in overnight or until all house pieces are firmly cemented. Remove pins before decorating. Start with the sides, let that dry overnight then add the roof pieces. I add cocoa to the royal frosting to “glue” the pieces together; it doesn’t show as much as a white frosting. Notice the long pins through both roof pieces? I use these pins to help hold the roof together while the royal frosting is drying, then remove them before decorating. Once the houses are assembled and fully dried…. Let the decorating begin! 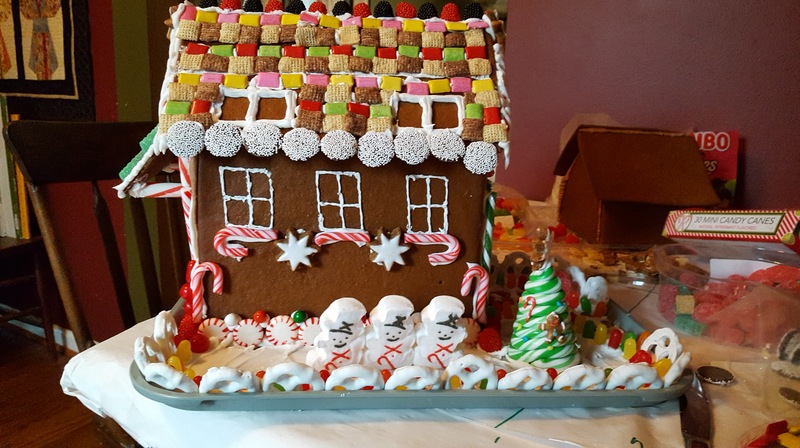 There are no rules with gingerbread except one: everything put on the house should be edible. Use royal icing to “glue” the candies, crackers, cereal, pretzels, etc. onto the house. 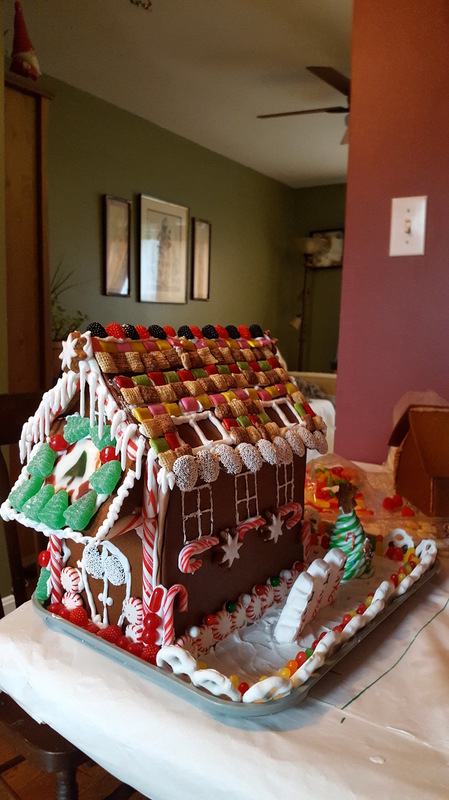 Some people like to make a symmetrical design, some just plaster as much candy as possible on the roof and sides. The design is totally up to the person doing the work. Just remember: no rules, no judgements, no problems! We always use a tray usually from the Dollar Store to put the house on and landscape a bit of a yard. Pretzels make a wonderful fence but over the years I’ve seen many unique and different fences. You are only limited by your imagination. So, once the holidays are over and you no longer want that fantastic gingerbread smell around the house what do you do with a gingerbread house? Some people actually eat portions of the house over the holidays. We do not. Our gingerbread experience is more about the planning and building of the house and how good it makes our home smell. We always put it out for our squirrels. They love it! and we love watching the turf wars that it incites. Usually a dominant squirrel will lay claim to the house and guard it fiercely until he feels the need to go hide pieces of candy and cookie. As soon as Mr. In-Charge is gone, it is pandemonium! Then there is a free for all looting of the small pieces of candy, pretzels, and cereal. The second string squirrels approach squirrel nirvana with all the fantastic goodies. The only thing we’ve noticed over the years, these little buggers are not too fond of peppermint(they eat that last) and they do not under any circumstances like Chicklet type gum(the little candy coated squares make great roof tiles but the squirrels do not eat them). Usually they go for the chocolates and anything with nuts first. Then they strip the house of everything else. It is great fun for the grandsons to watch the crazy antics of these furry creatures and laugh like little loons. Depending on the size of the house and the amount of decoration, it can take our backyard squirrels the better part of a week to finish off a house. Although, I have seen a pack of squirrels polish off a house in a day. So, if you’d like a little entertainment from your gingerbread house and you have squirrels, give them a holiday treat too….give them your gingerbread house.